The business of production is changing. The onset of digital direct manufacturing (DDM), directly going from CAD to a final product, is opening up opportunities for new kinds of production spaces such as microfactories, 3D print farms, and makerspaces. In this post, we’ll focus on microfactories: localized spaces that focus on providing a variety of services for a small number of customers. Watch our recorded webinar, Versatile Production: Print Farms, Microfactories, and Makerspaces, for more information on other types of spaces that help companies become more responsive, increase revenue, and optimize resources. Microfactories were first proposed by the Mechanical Engineer Laboratory (MEL) of Japan in 1990. Microfactories aren’t dissimilar to job shops or contract manufacturers, but they tend to focus more on smaller spaces, a wider range of process capabilities, and startup customers. Job shops often specialize in a few of the processes required for fabrication, whereas a microfactory is an end-to-end solution for an entire product. A job shop dedicated to metal cutting may offer metal bending, fabrication, and laser cutting services, while microfactories tend to offer a wider variety of services, such as welding, circuit design, 3D printing, and beyond. Microfactories allow companies to reduce the supply chain and quickly iterate on products even after they’re released, enabling on-demand production and, in many cases, a hyper-local focus. These spaces don’t replace traditional factories: instead, they fill a new need for small run, localized production, where one small factory may serve a single geographic locale. For example, General Electric’s Fuse microfactory in Chicago aims to inspire collaboration and facilitate small-batch manufacturing of products from their community. These spaces typically earn revenue by offering services to other companies, producing parts for startup customers, manufacturing their own product lines, or adding value for existing clients (for example, a design company may add fabrication to their list of services). 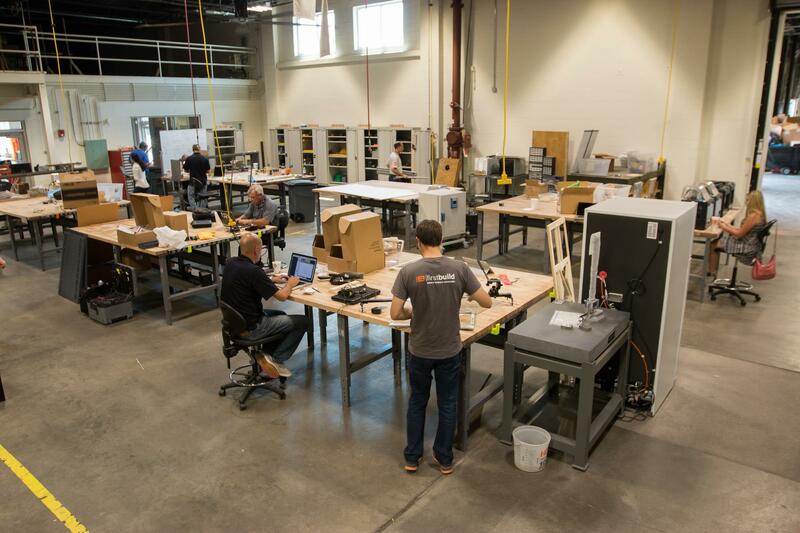 FirstBuild, backed by GE Appliances, runs a microfactory that brings ideas from their online community to life. There are a lot of reasons to start your own microfactory. A small footprint allows you to set up shop in a city, where there’s a greater concentration of new talent and new customers. With recent economic developments, there are a lot of opportunities for low- to mid-range volume production, which is what microfactories excel at&ndash;and if you just want to save cost, energy, materials, and space, a microfactory is the setup for you. Even if you’re an existing design or engineering firm, a microfactory could be a value-add for your client offerings. Here are some crucial steps for building your own small-scale, adaptable space for production. You can’t offer fabrication services without equipment, and buying equipment requires capital. You may be able to invest directly from your own pocket or seek capital from investors or a parent company. It’s also possible to start small: for example, begin with a 3D printer, advertise your services, and add more tools as your revenue grows. Five tool categories to consider when purchasing equipment. You’ll need to decide which of these material categories to focus on, develop deep knowledge of these categories, and purchase tools accordingly. For example, if you’re going to offer services around electronic products, you’ll probably want to invest in microsoldering stations, 3D printers (for cases), and circuit board fabricators. Develop enough knowledge about the machines you choose to confidently and realistically assess your efficiency and correct inefficiencies. Take factory tours, learn about workspace management, and watch a bunch of “how it’s made” videos. This can’t replace hands-on experience, but it’s a start. Automation isn’t just about robots. To run your microfactory well, you’ll want to put processes in place to automate administrative tasks and backend paperwork, such as scheduling, budgeting, and quoting. Setting up step-by-step assembly instructions and investing in employee education can save lots of time for workers and prevent miscommunication. For example, many service bureaus invest in quoting 3D printing automatically, which saves them a lot of time and money down the road. Organizations like Printelize offer software that makes this process relatively painless. Should you organize your production line around different processes, or on a per-project basis? Per-process organization means organizing your space around processes like 3D printing, welding, or laser cutting. Different stations focus on different methods. Per-process planning allows you to stack multiple orders into the stream, since each order will occupy a different process at a different time. However, if one order starts to back up or overwhelm the line, it’ll cause a ripple effect. Per-project organization means separating orders or projects out into different lines. This increases flexibility and versatility, and means you can use downtime on one line to handle overflow from another. The downside of per-project organization is that you’ll need more resources upfront to purchase multiple copies of different machines. Long term, this cost cap might limit your total production capacity by limiting the amount of lines you can have. Choosing your organization style is a balancing act, and it’s up to you to determine what works best. The largest benefits will probably be found somewhere between these two extremes. The overall goal should be to lay out a space that progresses in an orderly fashion that makes sense to you. Many companies put quality assurance right before shipping, for example, or welding right before sanding and painting. Across all of your staff, invest in employee training and make sure everyone is well-informed and up to date on the latest technology. Train your salespeople so they’re able to answer most technical questions and give accurate numbers to clients. Make sure you hire enough project managers to reduce stress and minimize mistakes. As you get more business, these managers will be crucial for avoiding backups on the line and other faltering. When hiring, experience in manufacturing is a plus. If you’re in an area where there used to be factories, look for people who used to do this for a living. Look for trade schools, vocational schools, or schools with great vocational programs. 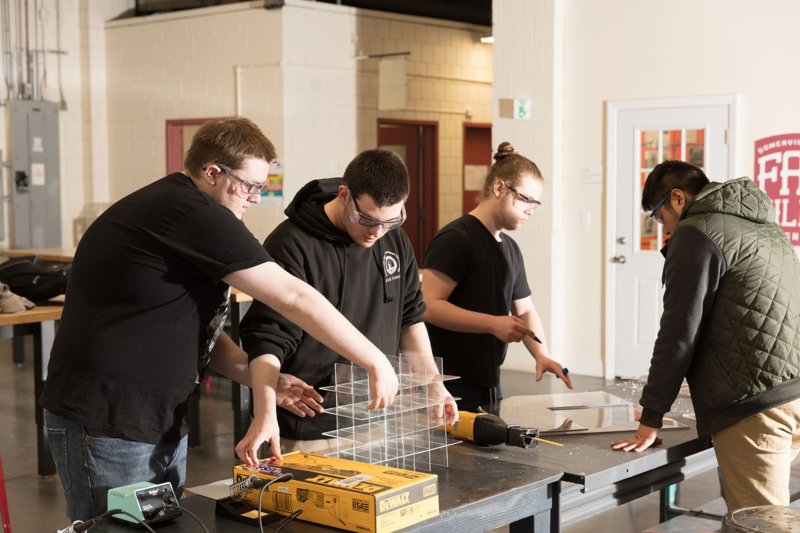 Somerville High School in Massachusetts trains vocational students to use modern technology and processes in their fabrication lab. Look for innovators. People need to be able to make decisions on the line that will be able to improve results, not simply follow top-down instructions. Eventually, these workers will know the line better than you do. Print farms: cells of multiple 3D printers, focused mostly on 3D printing fabrication. Makerspaces: collaborative community spaces, often based on a class or membership model, offering various fabrication tools and training for anyone to use them. Microfactories: localized spaces with a small footprint that focus on providing a variety of fabrication services for a small number of customers.